Insulin and leptin resistance are very common in the horse suffering from equine metabolic syndrome. Although the increase in levels of these two hormones is due to inflammatory changes on a cellular level, the rise in levels can contribute to various health problems in the horse. Many horse owners that own horses with insulin or leptin resistance often struggle month to month or year to year, battling the effects with little ground gained. If you step back and see the problem for what it truly is, better solutions for more complete management become available. Equine metabolic syndrome is often characterized by a horse that has an overweight body condition, a reduced level of activity or exercise, and becomes more prone to secondary health conditions which include insulin resistance, leptin resistance, and laminitis. Many of these horses are also predisposed to developing Equine Cushing’s disease or PPID. In a prior article, I discussed the connection between chronic inflammation and insulin or leptin function, which contributes strongly to the resistance that develops. Chronic inflammation impairs the ability of these two hormones to function correctly and bind to cells to do their job. When this occurs, a failure to bind, levels then rise in the blood stream. This inability of these hormones to bind to cells is referred to as ‘resistance’ and is the sole reason why the levels rise in the blood stream and noted on blood work. When insulin levels rise, due to resistance, they can then impact other cell functions in the body and further contribute to more inflammatory changes such as circulatory problems and laminitis. Leptin is a ‘satiety’ hormone, and when levels rise due to resistance, the body is often in a constant state of hunger. This means that often more food is consumed, more calories taken in, and a higher body weight for the horse. This then equates to a higher level of internal inflammation and the cycle continues. Okay, so you are getting the point that chronic inflammation is at the root of the problem, right? So what contributes to this chronic inflammation?? Look at chronic inflammation as being a smoldering pile of glowing embers in the background of your horse’s life. All horses have this, but the question is how big is that pile of embers and how much ‘heat’ is it giving off? That is what dictates the health problems in your horse. At times, it can seem well controlled, while in other instances, the glowing pile of embers turns into a raging inferno. This is when you see the acute flare-ups in laminitis or other health ailments. Inflammation is our goal…so how can you better manage it? Inflammation is our goal and that inflammatory process is what is closely tied-in with the insulin and leptin resistance that is present, if it is present. Keep in mind that not all overweight or metabolic syndrome horses have insulin or leptin resistance…yet. However, they all have an increased level of internal inflammation and if that process is kept unchecked, the condition will worsen over time, and with time, insulin and leptin resistance often develop. This is a progression of the disease and a development of a new problem, or symptom, associated with the primary problem of inflammation. Through more complete management of chronic inflammation in the horse, it is very possible to reduce the insulin or leptin resistance that has developed. Again, these are secondary events, not often primary. Address the primary issues and the secondary ones become more manageable. Dietary modifications by removing processed foods, concentrating on whole-foods, moderating grain intake, using high quality and nutritional forages and pasture. Stress modification by improving the environment, allowing access to pasture and herd mates, and proper use of adaptogen herbs to balance the internal process. Exercise regimens to include light to moderate workouts a few times per week at a minimum if the horse can tolerate, which helps to burn calories, improve body condition, and directly lowers inflammatory levels in the body. Hoof evaluation for evident hoof pain and overall condition of the feet, then implementing proper hoof trimming and balance to promote overall support and reduce discomfort. Herbal implementation to target the inflammatory process. Herbs can provide tremendous benefits to any horse, but especially are beneficial to the equine metabolic syndrome patient with insulin or leptin resistance. There are likely hundreds of herbs that can be used, but you must keep in mind that not every herb is appropriate for every horse. Just like foods, herbs have an energy to them with some being cooling in nature, some warming or heating, some are moistening and some may be drying. It can create confusion for many horse owners, but really, it is easier to apply than you think. The other factor when it comes to herbs is the dosage that is utilized. You must keep in mind that when it comes to your own health, spinach may be healthy and beneficial, but likely, one leaf of spinach is not going to provide much benefit. More so, it is recommended to consume 1-2 cups of spinach per day for optimal benefits. Now, translate that to a horse weighing 1200 lbs. Given this, do you think that 1 teaspoon (2.5 grams) is really going to be beneficial? When herbs are used alone, their dosage can be quite high. When they are used in synergism, with other ‘like’ herbs having similar benefits, their dosage can be reduced. This would be like combining kale with spinach, in which case volumes of both can be reduced to gain the recommended human serving of 1 cup per day, as an example. How do herbs impact insulin or leptin resistance in the horse? Primarily through reduction of inflammation and also provision of antioxidant support. Many herbs also have additional phytochemicals that have additional direct benefits in regards to inflammation, oxidative stress, and cellular health. Herbs can impact other health processes, such as circulation, metabolism, insulin and leptin function and cellular repair all by impacting inflammation and oxidative stress on some level. Here are a few herbs that I find very beneficial in horses with metabolic syndrome, with or without concurrent insulin or leptin resistance. All of these herbs have research backing their usage and benefits in metabolic syndrome and insulin/leptin resistance. The list goes on and on, but those are the most common herbs that I will utilize in patients. I don’t tend to focus on any specific herb or use any herb by themselves, but will more so use them in combinations, and at doses ranging from 10-50 grams per day or often per feeding. As mentioned, most of these herbs exert their clinical benefits through modulation of the inflammatory process, but how each herb does this can be different, thus synergism or combination is ideal. Many herbs directly impact the process of inflammation while also benefiting digestive health and supporting a healthy microbiome. This is often due to inherent pre-biotic properties present in that herb or food. Some herbs also have anti-microbial properties which additionally help to balance the microbiome in the digestive tract. Examples include blueberries, apple peel, bilberry, noni fruit, Terminalia chebula, Terminalia bellerica, Phyllanthus emblica, Poria cocos, and artichoke. When it comes to equine metabolic syndrome, insulin and leptin resistance, and laminitis in the horse, most owners are continually struggling to find balance. Sometimes, things seem under control, while other times, not so much. Due to the uncontrolled nature of this condition, most owners also continually battle financially as it can be costly to keep up with ongoing tests and medications. Keep in mind one thing when looking at your horse. In human medicine, people with type II diabetes have really two choices. Maintain their current status and take ongoing medications to control the symptoms of their condition or they can take control and practically eradicate it. Taking control refers to eating a consistently healthier diet, exercising, reducing stress, and possibly herbal supplementation. Research indicates that this type of approach actually produces the best results for the patient, but not many opt to take this level of self-control for various reasons. Those that do choose this route enjoy a healthier life, increased longevity, and reduced dependence on expensive medications. It is all a choice. Look at your horse with metabolic syndrome as being that person with type II diabetes. You too have a choice. Through changes mentioned above and targeted herbal therapy, many of these horses can completely recover and truly enjoy a pain free life. Others, if even only a few factors are changed or implemented, improve as well with less worries and management stress by their owners. Is this route expensive? I suppose it is all how you look at it. Look at the current expense that is being laid out currently between feed purchase, medications, veterinary visits, radiographs, blood work testing and then compare to a life that may just be whole-foods, markedly reduced veterinary visits, minimal to no radiographs or blood testing, no medications, and reduced husbandry needs on your end as an owner. Weigh the two out carefully and consider what could be, if all factors are put into play. Ask yourself one important question. When was the last time you saw a horse with metabolic syndrome, insulin or leptin resistance truly do well and be healthy, while on a processed food, restricted exercise, and medications? As a veterinarian, I can tell you that they can be ‘managed’ through this approach, but rarely do they truly thrive. 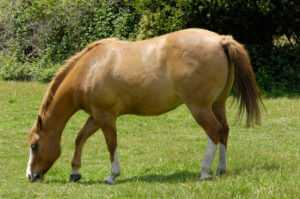 Equine metabolic syndrome, insulin and leptin resistance, are all reversible conditions. Does it take some work? Absolutely, but anything worthwhile doing is going to take some work at least initially, then over time, it does become easier. But, every factor must be addressed to the best of your ability. One cannot ignore the feet, diet, or influence of stress and believe that just giving a few herbs will negate those problem areas. This rarely happens. It is a group effort essentially and the end result is all dependent on the goals that you wish to achieve. Awesome article that sets forth the most important facts in a precise and clear manner and provides orientation. Thank you!